We would like to present this innovative technique that the author has developed at our centre. In Totally Supine Laparoscopic/Thoracoscopic oesophagectomy we position the patient in Lloyed Davies position and the right arm is elevated in flexion/abduction position. The abdominal phase is performed with standard five port laparoscopic technique followed by the right thoracoscopic mobilisation. The specimen is retrieved through an extended port and the conduit formation is completed. Intra thoracic stapled anastomoses is performed. 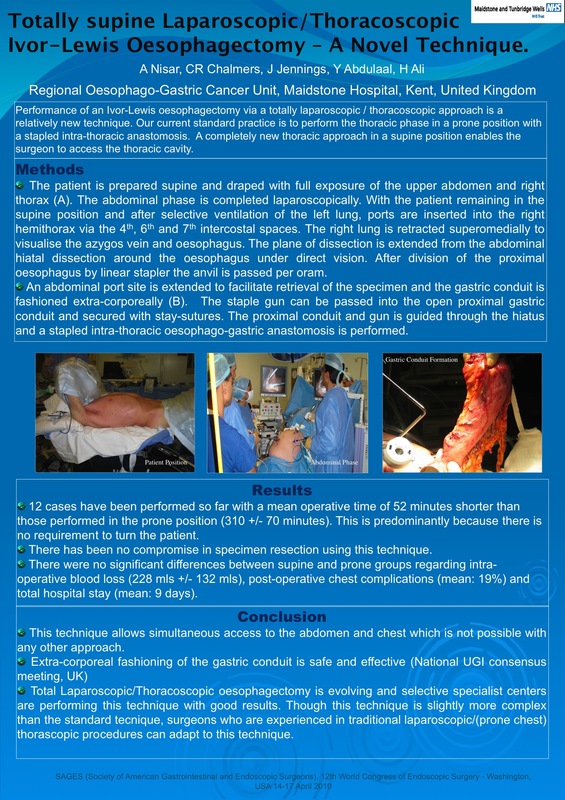 This technique has many advantages over the traditional Laparoscopic/ Thoracoscopic (Prone chest phase) oesophagectomy. It minimises the operating time as the prone position for the chest is not required. The conduit can be assessed outside the abdomen. It also offers another unique feature which is simultaneous abdominal and Thoracic access which is not available with any other technique. Though this is a technically demanding and slightly more complex technique than the prone chest position but the surgeons who have accomplished good experience and expertise in the traditional open and laparoscopic/ thoracoscopic techniques can incorporate this technique in their practice with its better access option for their patients.